The Celestron 44130 with 10x and 20x eyepieces and 4 included objective lenses (4x, 10x, 40x and 100x), you’ll achieve magnification ranging from 40x to 2000x. Strong and stable thanks to its all-metal construction, this microscope features a fully adjustable, mechanical stage so you can easily center your specimen slides. Improve the quality of your magnified images with the included 3 colored filters. The NA 1.25 Abbe condenser with iris diaphragm concentrates and focuses the lower illumination for enhanced viewing making the CM2000CF an excellent tool for labs, schools, scientific research and more. The CELESTRON LABS CM2000CF COMPOUND MICROSCOPE has many exciting features for users of all types. You can extend the lifetime of your CELESTRON LABS CM2000CF COMPOUND MICROSCOPE with the purchase of a FactoryOutletStore Factory Protection Plan. 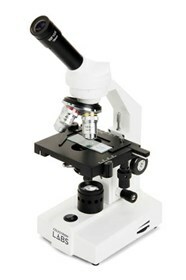 See the CELESTRON LABS CM2000CF COMPOUND MICROSCOPE gallery images above for more product views. The CELESTRON LABS CM2000CF COMPOUND MICROSCOPE is sold as a Brand New Unopened Item.